Do you have a text that needs translating? Read through the following questions. You’ll find out more about translation and even save some money in the process…. Isn’t translation expensive? What’s the added value of calling in a professional translator? A good translation has clear financial advantages. A professional text allows you to enter—and act effectively on—foreign markets. It’s a modest business investment. My company needs a series of translations into Italian. Must I use a native Italian speaker? As a rule, a professional translates into his or her mother-tongue. 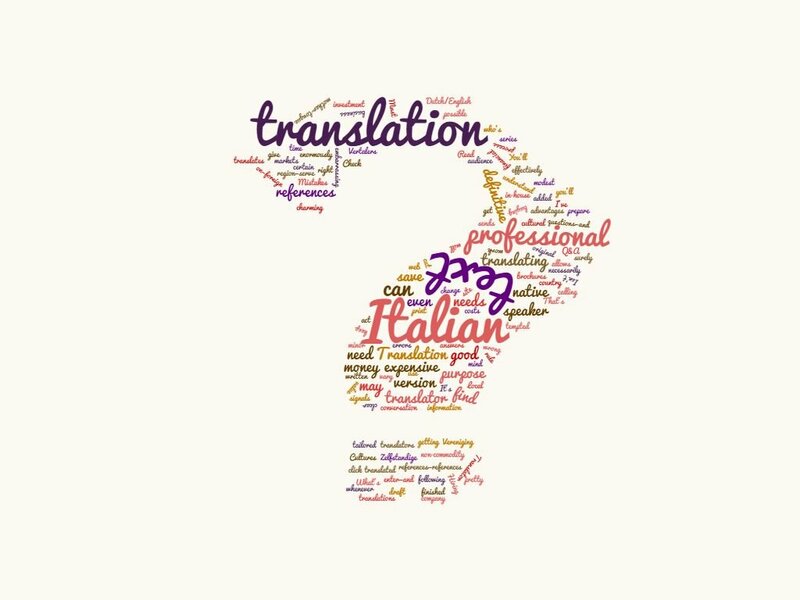 So, for your Dutch/English to Italian translation, you’ll need a translation professional who’s a native speaker of Italian. I’ve finished a draft version of my text. Should I get that translated while I work on the definitive version? To save you time and money, give the translator the definitive text whenever possible. My Italian is pretty good, surely I can prepare the Italian text in-house? You may be tempted to cut costs and do your own translation. But keep in mind that a written text with even minor errors sends off the wrong signals. Mistakes in conversation may be charming; in print or on the web, they can be embarrassing and expensive. Why do translators change certain references in the original text? Local references—references to the country or region—serve a purpose. But will an Italian audience necessarily understand that purpose? Cultures vary enormously. That’s why cultural and other references need to be tailored. Where can I find more information on translation and translating? Check out the brochures Translation – getting it right and Translation – buying a non-commodity on the site of the Vereniging Zelfstandige Vertalers. If you have any other questions about our services or about translation, please contact us.